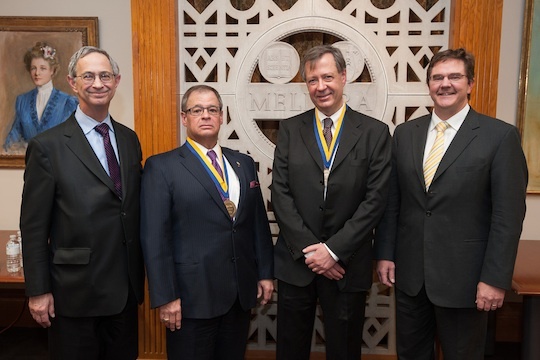 Robert L. McCrory was appointed University Professor in recognition of his contributions to the physics and engineering community, the Laboratory for Laser Energetics (LLE) and to the University in general, at an installation ceremony on April 3. "University Professorships are awarded for exceptional contributions to society and the University," said President Joel Seligman. "I am delighted to recognize Bob's accomplishments and extraordinary service with this professorship. As director of the LLE, he has led the largest single laboratory and research program at the University of Rochester. He has worked tirelessly in Washington, D.C. as an advocate for high-energy-density physics and the laboratory. He has recruited outstanding colleagues and has been a visionary of international prominence for his work," Seligman added. McCrory is one of only eight current or retired faculty members who are a University Professor. "Through his leadership of the LLE, Professor McCrory has served the University and its community with great distinction for over 30 years," said Peter Lennie, provost and Robert L. and Mary L. Sproull Dean of the Faculty of Arts, Science, and Engineering. "I am delighted we can honor him and recognize his work with this appointment as University Professor." Robert L. Clark, senior vice president for research and dean of the Hajim School of Engineering and Applied Sciences, shared similar sentiments. "Bob McCrory has prominently lead the Laboratory for Laser Energetics to serve as a resource to the global community in high-energy-density physics. The lab is unique as result of his vision and leadership," said Clark. "It is rare to find individuals who possess the skills to productively move science forward and simultaneously develop the necessary resources to serve the mission of so many." "It is with a deep sense of honor and humility that I accept the position of University Professor," said McCrory. "I am grateful to President Seligman, Dean Clark, Provost Lennie and the Board of Trustees for my selection as University Professor." At the same installation ceremony, Riccardo Betti was named the inaugural Robert L. McCrory Professor, prompting McCrory to say that he felt "twice honored." McCrory also reflected on the exciting implications for the future. "The time may be near when we see a breakthrough in the quest to demonstrate the scientific feasibility of the fusion process that will eventually provide a safe, secure, and environmentally benign source of limitless energy," said McCrory. "The LLE is a treasure for the University and a tribute to President Emeritus Sproull and the dedicated scientists who have brought distinction to the University." Under McCrory's leadership the LLE has established itself as a world-leading laboratory for the investigation of inertial confinement fusion. Since becoming the director, McCrory has been responsible for securing $1.6 billion in funding for the LLE. The laboratory has consistently received outstanding reviews from the Department of Energy and the National Nuclear Security Administration. The University's LLE is home to the Omega laser facilities, composed of the OMEGA 60 laser system (inaugurated 1995) and the OMEGA EP laser system (inaugurated 2008), for fusion research. Scientists from around the world utilize these facilities in their quest to develop nuclear fusion as a reliable energy source. Beyond research, the LLE is an important national source of graduate students trained in the area of high-energy-density physics and also hosts undergraduate and high-school students carrying out projects under the supervision of LLE researchers. McCrory received his bachelor's and doctorate degrees in physics from the Massachusetts Institute of Technology . He began his research in inertial fusion at Los Alamos National Laboratory, and came to the University in 1976. In addition to his position as the LLE director, which he has held since 1983, he also serves as vice president and vice provost of the University. In 1984 he was named associate professor of mechanical engineering and was promoted to full professor in 1986. He has also been a professor of physics since 1999. McCrory has served on several National Academy of Sciences committees on military space policy and plasma science. At the University, he has served as a member of the University of Rochester Faculty Senate (1986�1989, 1990�1992, and 1994�1996), and as the chair of the Faculty Senate's research policy committee (1997). He served as executive director of governmental relations for the University from 1997 to 2004. His honors include election as a fellow of the American Physical Society. He has been recognized with numerous awards including the Edward Teller Award given by the American Nuclear Society for his "pioneering research and leadership in the use of laser and ion-particle beams to produce unique high temperature and high-density matter for scientific research and for controlled thermonuclear fusion." Professor McCrory has authored or co-authored more than 250 scientific journal publications. Some of his key contributions to inertial fusion include his work on the wavelength dependence of hydrodynamic efficiency on laser-driven targets and the hydrodynamic stability of inertial fusion capsules.